COLUMBIA, Mo. — In the late 19th century, the corrupt political career of William “Boss” Tweed suffered serious blows from the cartoonist, Thomas Nast. Recently, a senior aide to Republican contender Mitt Romney made a comment about an Etch-A-Sketch that fueled comedians’ commentary. A University of Missouri political scientist and expert on political humor and satire says that comedians influence the political fortunes of public figures by influencing their public image. Horner pointed to the effect of Chevy Chase’s portrayal of Gerald Ford as a bumbling fool on “Saturday Night Live” during the 1976 election. When Ford subsequently appeared on the long-running sketch comedy show, his attempt at damage control only further solidified his oafish public image. During the 2008 election, Tina Fey’s portrayal of Sarah Palin was one in a million and the public image it created may stay with Palin for life, Horner said. Another politician whose public image took a beating from comedians was George W. Bush. Horner went to graduate school with Bush’s adviser, Karl Rove. George W. Bush and Gerald Ford may have been flummoxed by farce, but other politicians benefited from entertainment, noted Horner. Richard Nixon’s piano playing appearance on “The Jack Paar Show” helped to humanize him. More recently, during the 2008 Democratic primary, a Pew Research Center study found that media coverage of Hillary Clinton’s campaign changed after a “Saturday Night Live” sketch poked fun at journalists fawning over Barack Obama. Horner wrote a book tracing the development of television political humor and satire from earlier shows like “The Smothers Brothers Comedy Hour” up to the ’76 election. He examined in detail how “Saturday Night Live” influenced Ford’s campaign. The book is currently awaiting publication. In another of his books, “Ohio’s Kingmaker: Mark Hanna, Man and Myth,” Horner contrasted the real life of political manager Mark Hanna versus the media image of him. 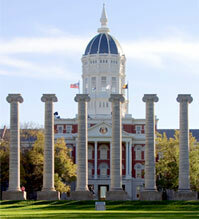 Horner began teaching at the University of Missouri in January 2001. In 2008 and 2009, Horner received the MU College of Arts and Science Purple Chalk Award for Excellence in Undergraduate Teaching. In 2010 he received the MU Chancellor’s Excellence Award for Lifetime Achievement in Advising for his work with Pi Sigma Alpha, the political science department’s honors organization.